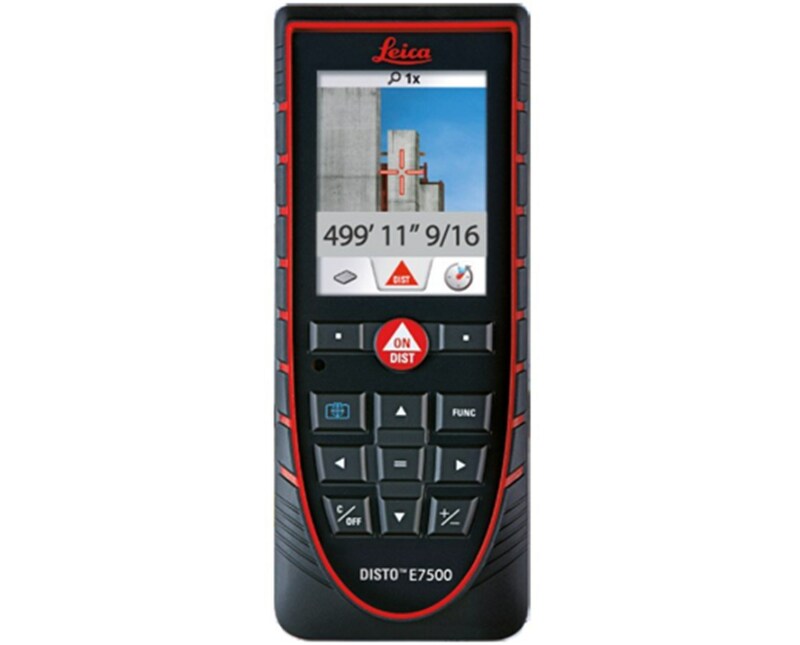 The Disto E7500 laser distance meter introduces a whole new standard of measuring possibilities with the super high accuracy. The modern design includes customizable shortcuts keys, outdoor real-time video display and 30 measurement storage, yielding a great surveying and construction tool for the modern age. 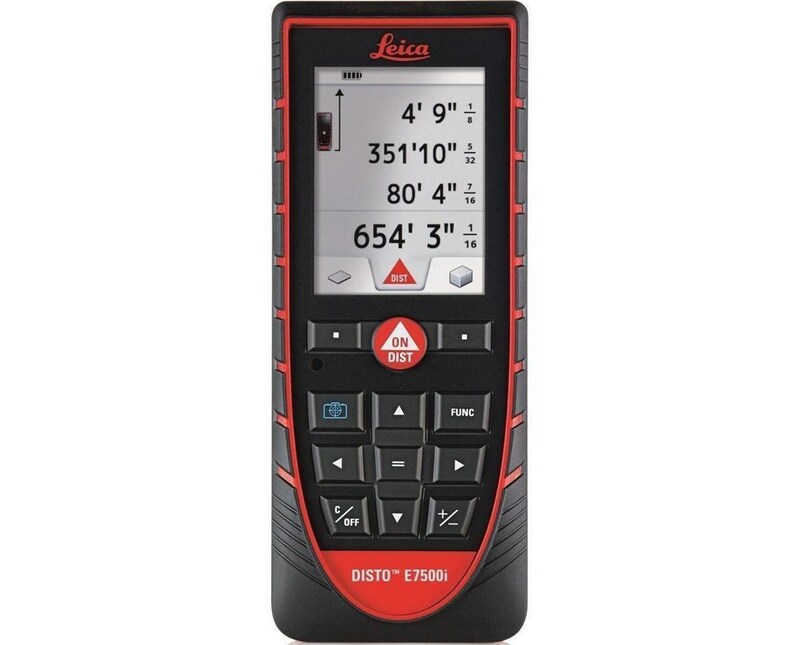 Suitable for outdoor use, the Leica Geosystems E7500 laser distance meter measures with ± 0.04" (1mm) accuracy and a range of up to 500’. The E7500 construction laser houses a pointfinder with 4x zoom on its large, high-resolution color display, allowing perfectly accurate measurements to be viewed and taken even in sunny conditions. The interface uses easily seen icons that are simple to select. It features an integrated help function that explains and shows how each function works. You can even assign your 2 favorite functions to a designated pair of key for super-fast access. The E7500 laser measurer also has a tilt sensor, allowing you to determine inclinations over your head and Smart Horizontal Mode that uses the tilt sensor to measure obstructed distances. This is particularly helpful when there are walls, hedges, and/or people situated between the device and the target. 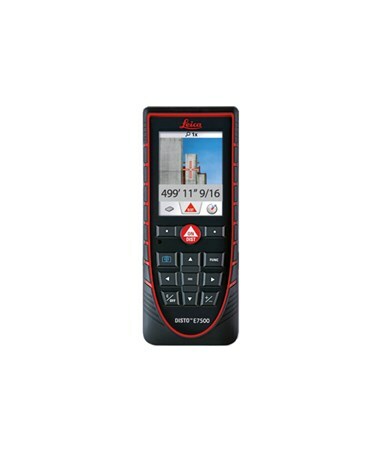 The E7500 features a volume measuring function that will calculate areas and their volume, removing the need to carry around a separate calculator. A very handy feature for gardeners, landscapers, facility management, real estate assessments, appraisers, and general construction professionals. Store up to 30 measured values and take 5,000 measurements on 2 AA batteries. To ensure sturdiness while measuring, the device can also be connected to a tripod. WIth an IP65 rating, the housing and keypad of the Disto E7500 are specially sealed to keep water and dust out. It is also extremely durable and well-protected, as it has been proven in drop tests of up to 6 feet high! The Disto E7500 is backed by a 3-year warranty.